This MSX 2 system, is basicaly a Sony HB-F1 with a 3.5" disk drive built-in the case (2DD, 720 KB). The keyboard is quite complete with a numeric keypad and special keys. There is a hardware PAUSE-button which hangs the computer when pressed. The SPEED-CONTROLLER slider (slow-motion) and the REN-SHA-TURBO slider (auto-fire for both joysticks and spacebar) are nice features for playing games. KEYBOARD Full stroke keyboard with numeric keypad and arrow keys. 5 function keys. HOME, INS, DEL, STOP, PAUSE, RESET. 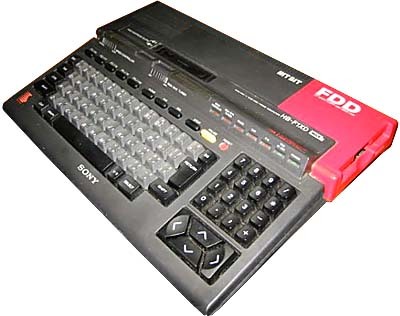 see more Sony Hit-Bit F1XD Ebay auctions !